United States Secret Service agent Wesley Charles is furious when his racist boss forces him to attend a seminar at the new law enforcement complex in Dallas. Wes knows the seminar is a monumental waste of his time; he belongs on the Chicago streets, doing what he does best, which is busting counterfeiters. The presence of Charles old friend Secret Service agent Louis Boron, Seattle cop James Allen, and beautiful DEA agent Wendy Weissman provide a welcome distraction from the mind-numbing classes. The four inadvertently discover that something menacing is lurking behind The Complex's facade of inter-agency cooperation. When their investigations reveal a conspiracy that threatens the very fabric of American democracy, they find themselves up against a powerful, unknown enemy- and running for their lives. The explosion came in the middle of the night, igniting the gas line, engulfing the little house in flames and tossing its occupants onto the floor. Wes choked on the smoke and felt for his piece. He tucked it into the waistband of his sweats, crawled to the bathroom and grabbed a towel from the rack. Somehow, the water was still running. He soaked himself and the towel in the tub thoroughly before attempting to break through the wall of smoke that had enveloped the master bedroom. He could hear Talbot's screams amid the crackling of the flames and the tinkling of glass. And he could hear Gordon calling his name from the direction of the kitchen. "Gordon," he shouted, "Can you hear me?" After graduating from the University of Iowa, with a BA degree in Sociology/Criminology, Mr Tucker began his career with the Federal Bureau of Narcotics in Chicago, Illinois and subsequently transferred to the U.S. Secret Service where he eventually was promoted to the position of Special Agent in Charge of the Secret Service Office for Arizona. Later, Mr Tucker received a Presidential Appointment as U. S. Marshal for the State of Arizona and afterwards was selected as the Chief of Court Security in Washington D.C., for the Federal Court system nationwide. Finally, he returned to Arizona and opened his own Private Investigation Agency. 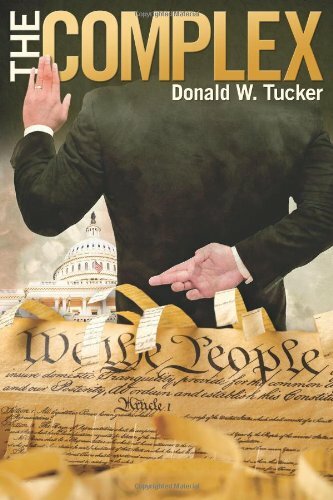 This is Mr Tucker's second book, the first was his auto-bio "The Two Edged Sword". Wesley Charles, a Secret Service Agent who would rather be on the job, is forced to attend a long-term seminar in Dallas. While there, he and his friends Louis (Secret Service) and Wendy (DEA agent) stumble across a conspiracy at the inter-agency “Complex”. The conspirators are high-level government and agency personnel who murder indiscriminately while pursuing their anti- everyone but certain white males - ideology. Before even guessing at what they’re up against, the three agents battle the unknown enemy while befriending and helping characters whose lives may be destroyed by the Complex’s cruel underlings. The anti-establishment, anti-conservative/right wing tone of the novel may turn off some readers. Character Kevin Riley, head of security for the Republican National Committee, is the terrifying mind behind the organization. Even Riley’s complimentary thoughts about Wes Charles’ intelligence, bravery, and law enforcement talents are expressed with vile prejudice. For instance, he ascribes intelligence in minorities as anomalies occurring only when a white man contributes to the gene pool. If readers, who are ideologically to the right of the views expressed in the narrative (who wouldn’t be? ), keep an open mind, it’s possible to love reading this book. After all his years spent in government law enforcement, the author is perhaps honestly conveying attitudes that he had to confront over the years. Author Donald W. Tucker has years of experience in law-enforcement – Federal Bureau of Narcotics, U.S. Secret Service, Chief of Court Security etc… His descriptions of situations and the settings/action in the book are better than an episode of CSI. The dialogue between best friends Wes and Louis will connect with the reader; Wes and Wendy’s interest in each other adds romance to the fast-paced plot. Adults who love action, conspiracy, and mystery will enjoy this novel.